Following its Annual General Meeting in Richmond Hill, the Ontario Minor Hockey Association is pleased to announce the members of its 2018 Board of Directors, effective immediately. Bob Hill of Ancaster was acclaimed to the position of President. Hill, who will serve a two year term, has been volunteering in hockey since 1986 when he started coaching while in university. 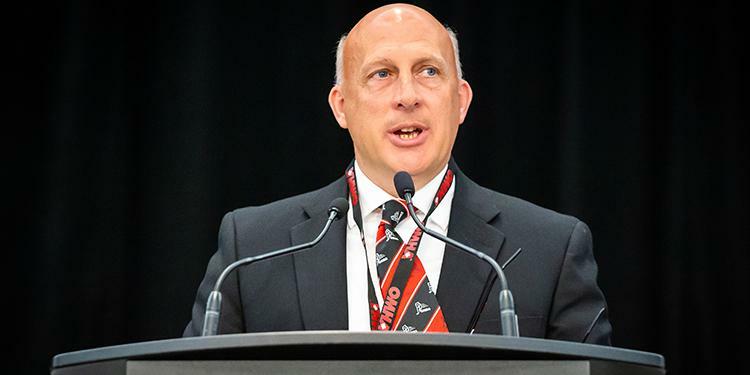 He has held numerous positions within minor hockey, most recently Vice-President, Central District with the OMHA, a position which will now be filled by Peter Harmsen of Stouffville. Outgoing President Rob Ring moves into the role of Past President. Steven Parker was acclaimed as Regional Director, Region 4. An HCOP-certified official, Steven also served as an Executive Member of the Barrie Hockey Referee’s Association, holding various roles including Director, Vice-President and President. He was a Convenor for six years for the York-Simcoe and Simcoe Region Leagues. Cathy Baker-Bell of Bowmanville was elected as Regional Director, Region 6. She has been involved in minor hockey for the last sixteen years, holding various positions on and off the ice. Cathy has served as bench staff, association board member, League Chair and Convenor. Please find a summary below of the results of the deliberations of the Notices of Motion by the Membership from the 2018 OMHA AGM.